Amanda at TooTallFritz wrote a great blog about personal safety and Personal Savers after they had a very scary incident with a local attacker. Here’s a little of blog, but make sure to click read more at the bottom check out the full blog. 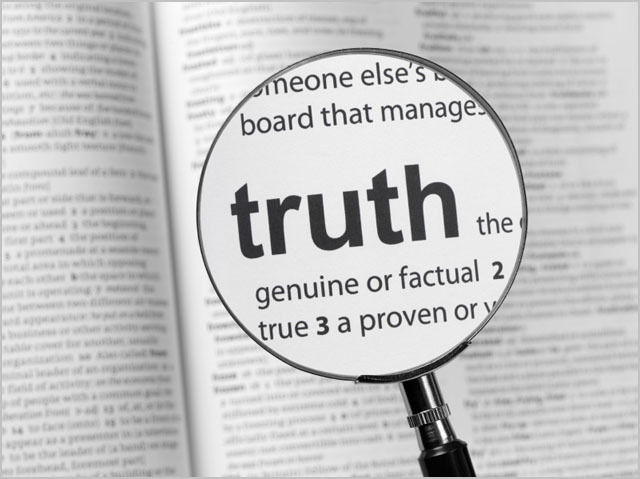 Just call me the “fact finder”. I think that’s an actual paid position for some publications but as a blog writer, the fact-finding job comes down to me, myself & I. The fact-finding mission for today was to determine the validity of a message circling our local Facebook running club pages regarding the attack of a woman on the LaPorte Road access trail in Mokena. Status of the attack = TRUE. The woman had an incident where a man , whom she had previously seen riding a bike in dark sunglasses & a hoodie, approached her on foot/running and attempted to push/pull/drag her to the ground. She screamed and shoved him and he ran off. She was uninjured. The man was in his late teens/early 20s and has not been found. The Will County Forest Preserve Police have jurisdiction over most of our trails, including this one. I have been assured that they have increased patrols and police presence on the trail and they are visible and alert. In response to the initial emergency call, they had 10-15 officers canvasing the trail the day of the attack; however, never managed to find the attacker. I was also assured by Mokena PD that although the trail is not their jurisdiction that they are more than willing to back up the Forest Preserve Police for assistance at any time. If you have an emergency on the trail, please call 911 or the Will County Dispatch so they can dispatch the Forest Preserve Police. The Will Co Dispatch #: 815.727.6191, program that number in your cell now (pretty please?). If you have information regarding a situation on the trail that is non emergency, please call: 815.727.8700. Although I hate to be redundant, I will once again address safety. If you need additional info or a full-fledged refresher, go to my original posts on safety: Tips on Running Safety HERE and Tips on Running in the Dark HERE. Please be vigilant while running and make eye contact with everyone you encounter. Only use one ear bud with music so that you can hear what is going on around you/possibly coming up behind you. Run with a friend or a group, if possible. If it’s not possible to run with a friend or group, then decide how you plan to best protect yourself if necessary. Think about what you would do if somebody approaches you and tries to knock you down for an assault. This is not supposed to scare you but help you THINK about what action you plan to take. For me, I have limited knowledge in self-defense and I have made the choice to carry pepper spray but above all, I am always “watching and listening” to what is going on around me. 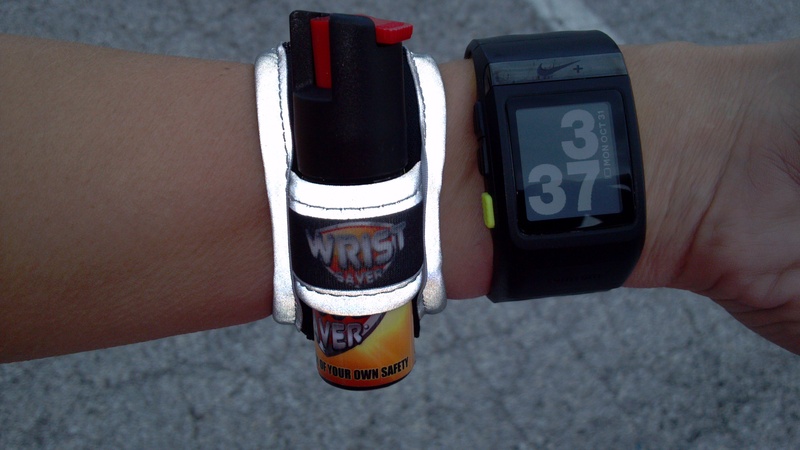 For pepper spray, I have chosen the Wrist Saver from PersonalSavers.com. I know that pepper spray is not for everyone, I’m not saying its the right choice for you but I feel confident in my ability to use it correctly and be able to flee from an attacker with its aid. Look HERE for the proper ways to use/spray pepper spray so that you will know how to use it, and not lose it to your attacker. PersonalSavers.com has generously donated a PINK Wrist Saver and a PINK Personal Saver for me to giveaway. The Wrist Saver attaches to your wrist via velcro (see the pic of mine above), bike handle, or stroller handle for easy access & use. It also has reflective accents, an id card and a small light. 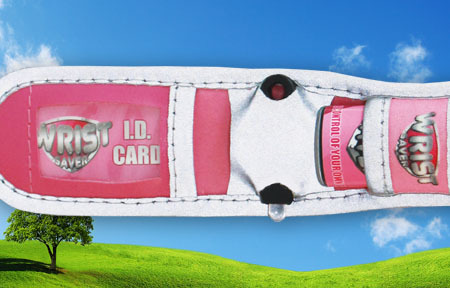 The Personal Saver has both a key ring and a clip to attach to your waistband, hydration or Spi-Belt. If you would like to order from PersonalSavers.com now, use the discount code: TTF for a $1.50 off your purchase and a free Personal Savers microfiber towel.